We all know that the shore around our lakes here in St. Petersburg, Suncoast and Tampa is some of the most beautiful in all of Florida. This is very true when summer comes around and families and friends get together to enjoy barbecues and dips in the water. However, in order to make sure that our lakeshores are as enjoyable as possible means that they need to be as clean as possible—and for that task in St. Petersburg, Suncoast and Tampa,—there is only one team to call. With years of experience in all types of lake and shoreline cleaning, we at Lake & Pond Maintenance Inc have developed a reputation for excellence. Our superior skills are second to none and we will always work diligently to maintain the high standards that we set for ourselves each and every day. So, whether you are concerned about the cleanliness of your local beach or simply want to make sure that your residential lake is algae-free, then we should be the first and only number you call. How to Get Rid of Algae in Your Lake? Like anything in life, there is a right and a wrong way to get rid of the algae on your lake. If you want real and lasting results, then you need to go with the first option and that means getting in touch with us at Lake & Pond Maintenance Inc. Our skilled team is completely committed to what we do and will stop at nothing in the pursuit of lake and shoreline cleaning excellence. With that in mind, here are four of our most effective techniques for removing algae from lakes in St. Petersburg, Suncoast and Tampa. Mechanical Intervention: Mechanical methods of algae removal involve removing blooms with a rake, screen or tool of some description. Although they are reliable methods of algae removal, the fact of the matter is that they rarely fix the deep issues at the heart of algae. For that, a more thorough cleaning technique is needed. Physical Intervention: The simple fact of the matter is that every lake is different and every type of algae in each lake is also not the same. Factors such as aeration, light and nutrient content all play very serious roles in algae treatments and help determine whether or not algae will bloom in your lake. A physical intervention from us can promote positive physical characteristics which will enable us to remove your algae quickly and effectively. Biological Intervention: Another approach to algae treatment is the biological route. The complex ecosystem apparent in lakes of all sizes means that on occasion the best way of dealing with an issue of this nature is by introducing fish like tilapia into the pond. Material Intervention: One of the most common methods used for controlling noxious algal blooms is with the use of algaecides. When used by a professional, algaecides can provide safe and effective management of harmful algae blooms. 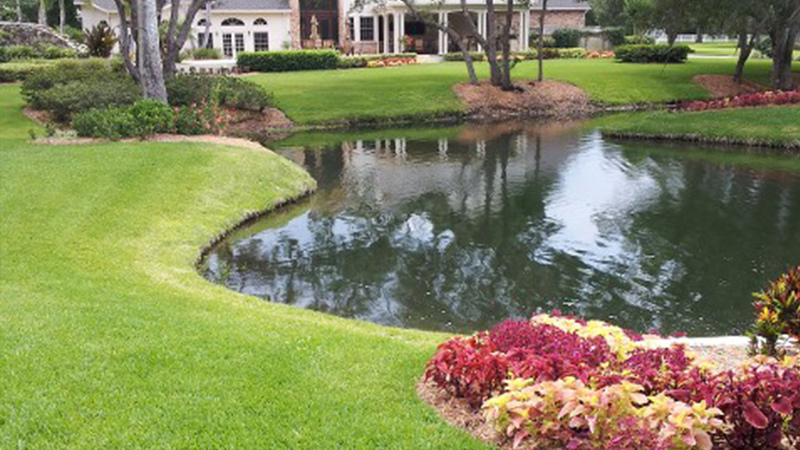 If you want a superior algae treatment for your lake or shoreline in St. Petersburg, Suncoast and Tampa, then you need to contact Lake & Pond Maintenance Inc today.